AppNexus’s cloud-based software platform powers and optimizes the programmatic sale and purchase of digital advertising. 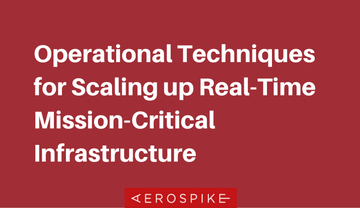 In this recorded webinar, you’ll hear how AppNexus scaled its infrastructure without any downtime. Christopher Bowman, Director of Data System Operations at AppNexus, explains the operational techniques used to scale up a core component of the AppNexus infrastructure, namely, the server-side cookie database (cookie monster), even as a substantial portion of the world’s internet advertising was flowing through the AppNexus infrastructure. The capacity of the cookie monster has now reached tens of billions of objects and millions of read/write operations per second and the system runs in half a dozen geographically distributed data centers. This webinar is based on the experience in expanding the system over several years while ensuring no interruption of the service at any time.